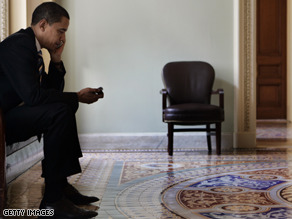 (CNN) - President-elect Barack Obama told CNN Friday he thinks he may be able to “hang onto” his BlackBerry after all. In an interview with CNN’s John King, he talked about the privacy issues that threaten his ability to maintain normal communications – and his optimism that, unlike his predecessor, he’s going to be able to keep using e-mail after he enters the Oval Office. Catch the full interview this Sunday on the premiere of State of the Union at 9 am ET. “You going to do it?” asked King. Obama – who has held pre-inauguration off the record sitdowns with reporters and columnists from across the political spectrum, but not yet the journalists of the New York Times - also took an offhand swipe at that paper’s editorial page. King’s full interview with Obama airs tonight at 6 pm in The Situation Room. Read Paul Begala on Obama's quest to keep his BlackBerry. Could I have President-elect's blog #? It is most important for our new president to stay in touch with "the people". Keeping his BlackBerry may be one sign that he will keep in touch. It kind of scares me that someone wants to take away his link to the outside world. I don't want him only fed info that the secret service want him to hear. Let him use his blackberry and know what is going on outside of what 'his people' tell him. All they have to do is give him his own server and station a secret service next to it. You can't tell me the NSA doesn't have a secure line somewhere that they can plug a secure server into. This is so silly. The president of the united states should be able to have a mobile device. I mean the last one was cut off from the world. and look where that got us. NOW THAT'S OUR PRESIDENT, GOD BLESS HIM!!! GOTTA LOVE A GUY WHO DEMANDS TO STAY GROUNDED AND IN TOUCH WITH TECHNOLOGY AND WORLD, UNLIKE THE LAST DEAD-BEAT KNOW-NOTHING PRESIDENT BUSH!! Shortsighted much? Or maybe you just have a short-term memory and can't remember more than one sentence at a time. I said it doesn't matter which side you're on abortion. What worries me is the fact that someone's moral or religious ethics are being superceded by the state. Marxism and communism are all about the good of the state and the community over the good of the people. Little things like ethics and religion went out the window in the interest of "quality of life." The shortsighted among you will see the lawsuit as a victory for abortion rights. That's fine, I don't care either way. I see it as the ACLU setting a precedent to shoot itself in the foot down the line when it comes to the beliefs of an individual over a corporation, which is what it ironically enough is supposed to stand for. Let him keep it. Good for him, for dragging the government, kicking and screaming, into the 21st century. I love this guy..sorry..i love my President -Elect!! Why should Obama not keep his Blackberry? What law says he can't contract for cell phone/browser service like the rest of us? Of course, he'd have to take special security precautions, though. I'm not sure what you're referring to on this board, but I also do not understand your definition of marxist. We are always part of a community, and my rights cannot trample on your rights, because that's best for the community. We pay taxes to better our communities, and hopefully, our country. Is that marxist? Maybe you want to go live in a commune somewhere, but no, in that case, all individual rights are superseded for the good of the community. Government should not be wiretapping us, nor torturing us, nor demanding excessive taxes, but I feel we do need government to help with things our small communities cannot accomplish alone. And where was all the concern about rights when Bush and Cheney were taking them away as fast as they could find one to take? Suddenly I read about the MARXISM of Obama...I'll take that over Bush's facism any day. In this day of technology, there's gotta be a way he can keep it. He's keeping a device but he's trading it in for a Windows Mobile device that actually has this thing called encryption. I would hope he's too busy to be playing with a Blackberry. Most people use them as a toy. for answers all he would have to do is ask the question in the air and he will be answered. And i;m sure there will be a phone for SPEAKING with his family- not texting them! Some Blackberries and Cell phones have GPS locators that turn on the minute the unit is turned on, I hope Mr Obama realizes that some hacker might be able to lock onto the gps locator and know precisley where President Obama is. Seems to me it would be relativly easy to launch a weapon with the gps coordinates. God forbid that would happen, But maybe President Obama should give up the blackberries!! What do you say Mr President??? I am really surprised that a president does not have a desktop computer on the main desk in the oval office. I mean – come on already – Captain Picard had a computer in his ready room – why shouldn't a U.S president? It is like once you are president – you have to go back to 1945 or something. Whatever he sends to his family should be private and not go into the library. What is really going to happen? -is he gonna email his wife and say – " I need you to break into the Republican HQ and look for the documents on the real reason we went to war". When Obama makes any speeches from the oval office desk – I expect to see a nice compact monitor to show that we are current on technology – and that he has access to every bit of news we do. Make It So !! Good for Obama, don't let them push you around. He gets very nervous if he even thinks he may be cut off from whatever he feels he must be connected to. Keeping the President out of the loop is dangerous and he knows it. Its also a great safety tool...if he has to, he can call 911. I love the fact that he is so smart, has thought things through and makes his own choices. No Cheney is going to manipulate him. Right, he can lead us in this new century and has the leadership qualities that we have needed for s-o-o-o-o long in this country. It looks like everyone is going to be included, he is working hard to bring us together and in this way, we can do the work of progress and we can do it rapidly if we work together. I hope he thought he decision through. I wish experts could tell him more about security, i mean what it takes to hack into his blackberry.